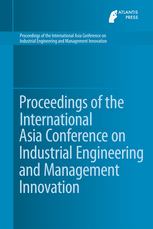 The proceedings in this series originate from the conference series 'International Asia Conference on Industrial Engineering and Management Innovation' (IEMI) whose aim is to share and disseminate information on the most recent and relevant researches, theories and practices in industrial and system engineering and to promote their development and application in university and enterprises. The IEMI-conferences are sponsored by the Chinese Industrial Engineering Institution, CMES, which is the first and largest Chinese institution in the field of industrial engineering. CMES is also the sole national institution recognized by the China Association of Science and Technology. The conferences are organized by CMES and the Tianjin University of Science and Technology.